Quiche is one of those things that you can eat for breakfast, lunch, or even a casual dinner...it's that versatile. In the morning you can enjoy it with some fresh fruit; with roasted asparagus for lunch; and with a dinner salad in the evening. All are delicious options in my opinion and since we've been living off quiche for the past few days, I wanted to share my two favorite recipes to date--one vegetarian and one not. I use this Pate Brisee recipe for both quiche recipes and then use the filling recipes as indicated below. TO MAKE THE FILLING, melt the butter in a small pan. Add onions, and saute over medium heat for a few minutes. When they begin to soften, add the mushrooms, salt, pepper, thyme & mustard. Saute for about 5 minutes more and remove from heat. IN A BLENDER, combine the eggs, milk and flour. Blend well. 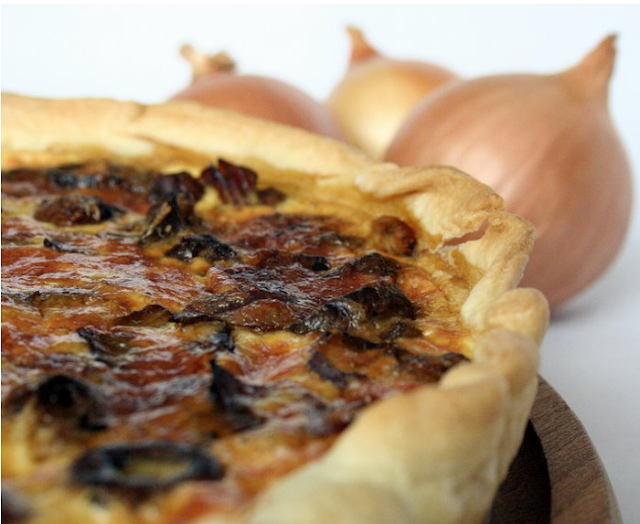 SPREAD the grated cheese over the bottom of the unbaked crust and then spread the onion-mushroom mixture on top. Pour in the custard and sprinkle the top with paprika. BAKE for 35 to 45 minutes, or until solid in the center. Serve hot, warm, or at room temperature. 3/4 cup heavy cream, room temp. 3/4 cup milk, room temp. TO MAKE THE FILLING, in a frying pan over medium-high heat, fry the bacon until crisp and golden, 3-5 minutes. Transfer to paper towels to drain. When cool enough to handle, crumble into small bits. Scatter the crumbled bacon over the bottom of the pastry shell. IN A BOWL, combine the cream, milk, eggs and melted butter. Using a whisk or fork, beat until well blended. Stir in the cheese and season to taste with salt and black and cayenne peppers. Pour into prepared pastry shell and sprinkle the top lightly with nutmeg. BAKE at 375 degrees until the custard is set and the tip of a knife stuck into the center of the custard comes out clean, 25-30 minutes (note: I find that I need to bake mine for about 40 minutes; perhaps its the altitude?). Remove from the oven and let stand for several minutes before serving. I love when I am itching to make something easy and tasty for dinner and you provide me with the inspiration. Thank You! Quiche is my favorite, I'm thinking quiche for dinner! Oh quiche is one of my favorite go to meals! Any time of day. And the more veges the better. Thanks for the wonderful post!